A slow start, a moderate build-up, a frantic finish with Mo Farah winning. Can anyone prevent this scenario from playing out in Moscow? Such has been the British runner’s dominance over 5000m and 10,000m on the track in recent times that it is surprising to reflect that it has been relatively short-lived. 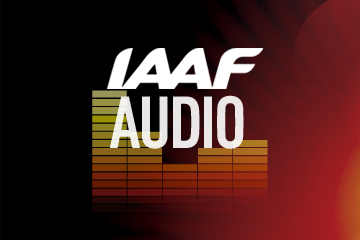 A double at the 2010 European Athletics Championships had limited significance in a world dominated by African distance runners and Farah’s first race at the Daegu 2011 World Championships saw him beaten to the line in the 10,000m by Ethiopia’s Ibrahim Jeilan after an eye-popping sprint in the last 400 metres. However, since then, it has been Mo, and more Mo. Farah took the 5000m in Daegu, holding off USA’s Bernard Lagat and Ethiopia’s Dejen Gebremeskel comfortably enough in the straight, before shaking the Olympic Stadium to its foundations last summer with a distance double at London 2012 Olympic Games, and he will start favourite at both distances in Moscow. How to beat him in the 5000 metres then, and if you work out how, then who can do it?Remember this is a man who also set a European 1500m record in Monaco less than a month ago. Tactically astute, aware of being in the right position at the right time, combined with finishing speed of sub-51 seconds, demonstrated in the European Team Championships 5000m this year, suggests it would be folly to rely on trying to beat Farah in the last lap. In the London 5000m final, Ethiopian team mates Gebrmeskel and the young prodigy Hagos Gebrhiwet tried a long run for home, picking up the pace over the last four to five laps. Again, Farah trumped the opposition, though it must be said the acceleration was neither savage enough nor sustained all the way through to the finish. So who is game to try something else in Moscow? It might be Lagat, who continues to compete at a high level despite heading into his late 30s. 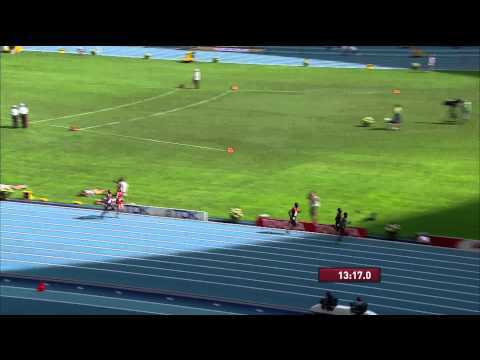 Lagat loses little to Farah for tactical nous and is one of the few who might beat him for finishing speed. Galen Rupp, Lagat’s US team mate and Farah’s US training partner, might also possess the strengths to bring Farah down. Sharing the same coach as Farah in Alberto Salazar, Rupp has made unspectacular progress to quite spectacular performance levels. Is he now ready to step out of his training mate’s shadow? 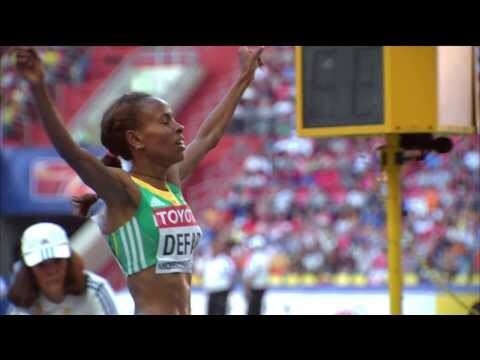 Courtesy of Isaiah Koech’s wild card as 2012 IAAF Diamond Race winner, Kenya fields four competitors. Koech ran, and won, the trial anyway, showing an impressive finish to defeat Thomas Longosiwa and Edwin Soi. 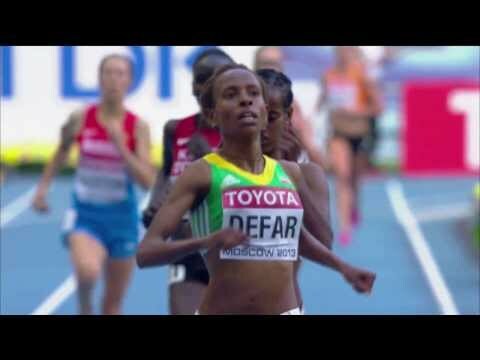 All three have the credentials to take the race on in Moscow and Soi did out-kick an admittedly unwell Farah to win the 5000m at the Diamond League meeting in Eugene on 1 June. In something of a surprise, the Kenyan selectors gave the final spot to John Kipkoech, a former World Junior Championships silver medallist who finished just fifth. If Ethiopia again selects on times, its trio is likely to be Yenew Alamirew, Gebrhiwet and Muktar Edris. Of the three, the aggressive Gebrhiwet may be the one bold enough to try to take the race away from Farah. He has Diamond League wins in Doha (at 3000m) and New York to his name this year and was a close second behind Alamirew in Lausanne. Since Eliud Kipchoge won in Paris in 2003 in a championship record 12:52.79 we have not seen a fast World Championships final but, whatever the ultimate outcome in Moscow, someone is going to have to be running very fast for a significant portion of the race to beat Mo Farah. And even then, Mo may just run a little faster.